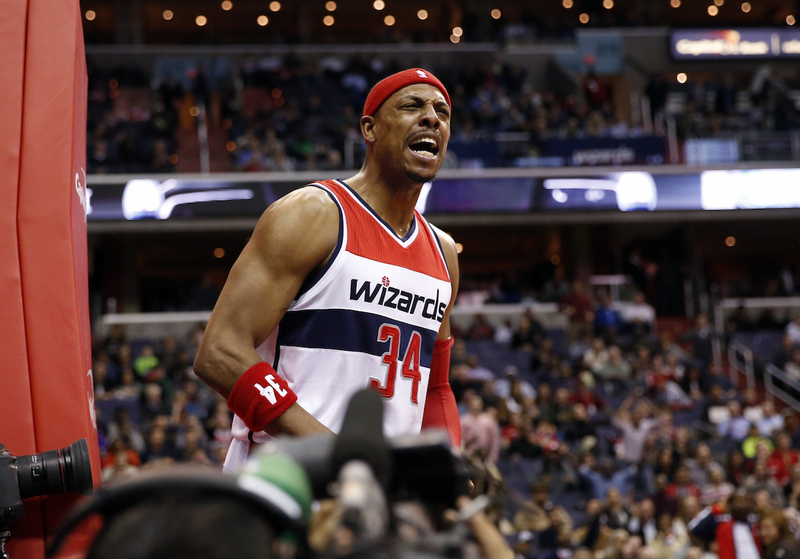 Ask Paul Pierce, and he will tell you: When you have suffered, when you have failed, when you have known what it is to be humbled — when you endure all of that and emerge on top, triumph is all the sweeter. The journey of the 6’7″ Los Angeles Clippers forward from the playgrounds of L.A. to superstardom and back again is astounding both for its success and how it was achieved. From his childhood through college and the NBA, Paul toiled on the court, working tirelessly on his game, never with fanfare, always with confidence. Today, No. 34 is consummate player, the stalwart defender and offensive dynamo who faced up and defeated LeBron James and Kobe Bryant in the same championship playoff run. He is an all-star, NBA champion and Finals MVP, and all the while, he has lived up to the meaning of his nickname — the Truth — by staying true to himself. When you are raised in the shadows of the Great Western Forum, home to the Lakers until the turn of the century, basketball is in your blood. Born on October 13, 1977, Paul Anthony Pierce spent his childhood in Inglewood, California, a Los Angeles suburb. The great Lakers teams of the 1980s captured his imagination, and basketball quickly became his first love. Gangs were everywhere; basketball kept Paul and his two older brothers, Jamal and Stephen, out of trouble. Both of Paul’s siblings receiving college athletic scholarships: Jamal for basketball and Stephen for baseball. Meanwhile, Paul honed his game on the city’s courts, dreaming of becoming the next Magic, and taking steps in the right direction with the help of Scott Collins. Collins, an Inglewood Police detective, was extremely active in the community, and coached youth basketball in the Police Activity League, which offered low-income kids the chance to play organized ball. Collins even snuck his kids into the Forum when he worked security for Lakers games. “Coach Collins was not only a father figure to me, but to so many other young kids growing up,” Pierce said in an interview for Beyond the Glory. Paul was a prolific athlete, playing hoops, volleyball and bowling through the P.A.L. leagues. As young Paul quickly discovered, however, simply being good is not enough. When he entered Inglewood High School, he was, by all appearances, an average basketball player. His skills were evident, but he lacked the prototypical size and strength that usually signify a college prospect, and was cut from the varsity team as a freshman. Paul was undeterred. He started going to school at 5 AM to practice with a few other players on the team. A year later, the 5’8″ sophomore made the varsity squad. Barely. The first game of the tournament saw Inglewood on the wrong side of a lopsided game. Roy thought it was a decent chance to get the young Pierce on the court. His spot in the starting lineup now secure, Paul worked even harder. His body began to catch up to his ability. His junior year, Paul lead the Sentinels to a 30-win season, and a division title. 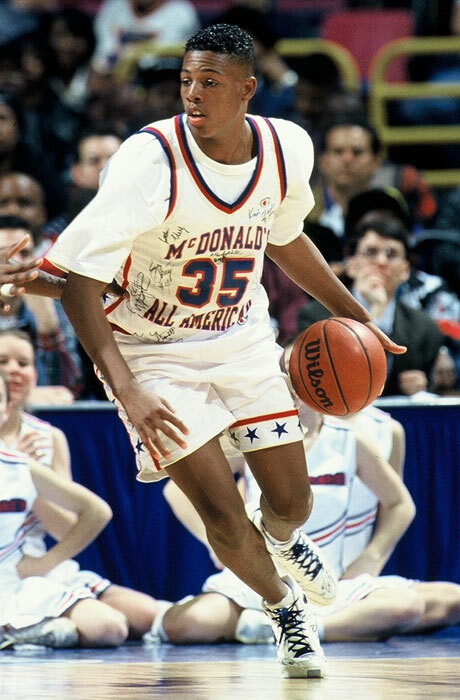 His senior year saw him become the number one high school prospect in the state of California, and earn a spot alongside other future stars like Kevin Garnett, Stephon Marbury, Antawn Jamison and Vince Carter in the McDonald’s All-American game. He even participated in the Slam Dunk Competition, losing to the high-flying Carter. 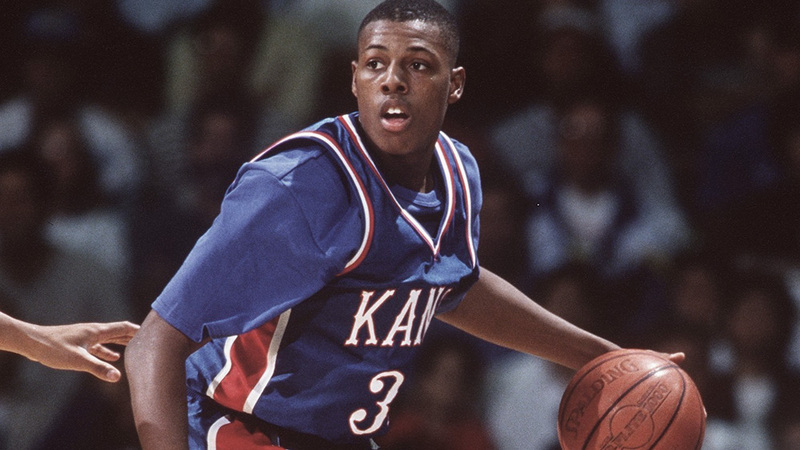 By that time, Pierce had already decided to attend the University of Kansas, and play for legendary coach Roy Williams. Williams had been his persistent recruiter, but earned Paul’s respect for his recruiting approach. Williams was equally high on his young star-in-the-making. Paul burst onto the scene in Lawrence, earning Big Eight Freshman of the Year honors in 1996. He followed that with back-to-back Big 12 Conference Tournament MVP awards, and was voted an All-American after his junior season. All the while, he was developing a reputation for being a player whose game rose with the importance of the situation. “The bigger the game, the bigger he played,” Williams said. His sophomore season saw theJayhawks enter the NCAA tournament with only a single loss, and the overwhelming favorite to win the national title. But a heartbreaking 85-82 defeat to Arizona — the eventual champions — in the Sweet Sixteen shattered Paul’s dreams. At the post-game press conference, Paul broke down, showing the heart and emotion fans would come to recognize as unmistakably his. 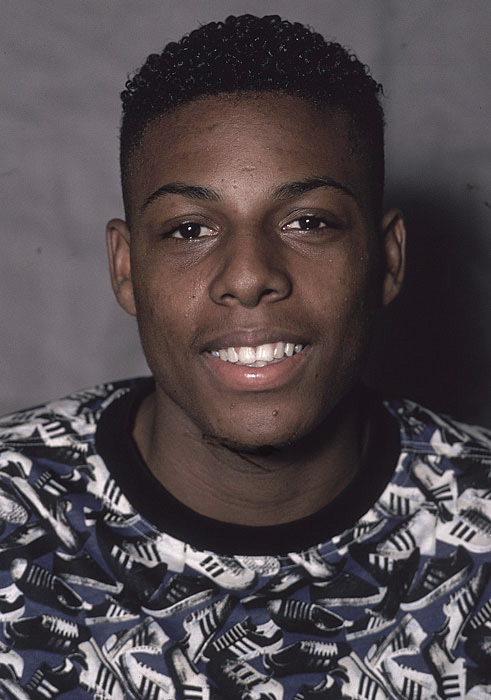 Over his career as a Jayhawk, Pierce averaged 16.4 points and 6.3 rebounds per game, and was regarded as one of the premier college players in the country. At the end of his junior season, it was time for Paul to take the next step in his career. 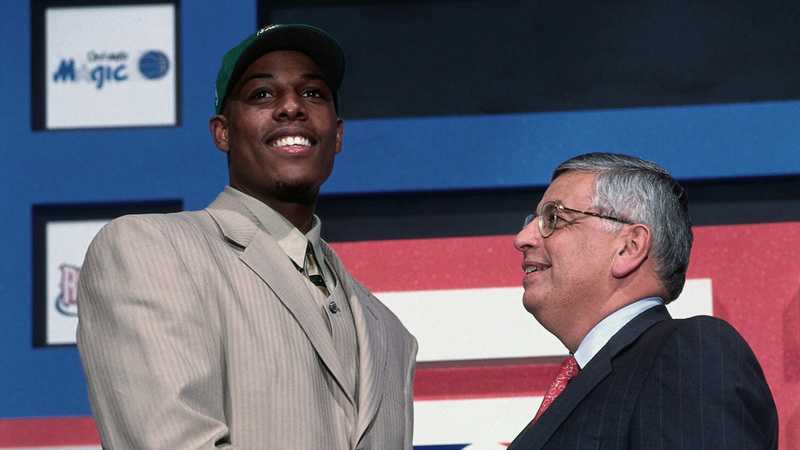 Paul was regarded as one of the top prospects in the 1998 NBA draft, a sure-fire lottery pick. But as the draft began, and names were read, one after another, he began to slide down the draft board. At pick number 10, Paul’s destiny changed forever. He was selected by the Boston Celtics, a team that hadn’t even worked out the small forward prior to the draft. It was a tribute to his talent. A member of the team he had despised growing up, Paul was heir to the same parquet floor that Larry Bird and Bill Russell had made their own. A part of the Celtics tradition, the player who was expected to lead the franchise back to its rightful place atop the league, he had tremendous expectations to fulfill. From his very first game, Paul made his commitment to that tradition clear. A starter, he scored 19 or more points in 10 of his first 11 contests, and was on his way to being one of the best young players in the game. For the year, he averaged 16.5 points and finished third in the voting for Rookie of the Year honors. His second season, he raised his scoring average to 19.5 points per game, and was turning into one of the elite offensive players in the NBA. By his third year in the league, Paul was ready for a breakout year. Paul’s NBA dreams and his life, would be put in serious danger just one month before the coming season. In September of 2000, Pierce and two teammates went out to the Buzz Club, a local Boston nightclub. “That was the night that changed my life forever,” Paul said. Boston police arrived at the club at 1 AM, responding to a call that someone had been stabbed. Paul was the victim. He had been knifed 11 times, in the face, neck and back. Two things saved his life. First, the club was just minutes from New England Medical Center, which allowed Paul to receive treatment before losing a lethal amount of blood. Second, Paul was wearing a heavy leather jacket, and the thickness of his coat kept knife blows — like the one that penetrated seven inches into his abdomen — from reaching his heart. Instead the knife just missed a number of key internal organs. He would survive. Incredibly, one month after the incident, Paul was in Boston’s starting lineup to start the 2000-2001 NBA season. It would turn out to be his best so far: He averaged 25.3 points per game, and was selected to his first All-Star team. He was also given a nickname — the Truth. A year later, No. 34 led the Celtics on a surprise run to the Eastern Conference Finals (see right). It included the biggest come-from-behind victory in playoff history, overcoming a 21-point fourth-quarter deficit to beat the New Jersey Nets in game three. Nineteen of Paul’s 28 points had come in the game’s final period. The 2002 season was also a great year for Paul on a different front. He started his own foundation, the Truth Fund, which helped provide educational and athletic opportunities for disadvantaged youths in the greater Boston area, as well as his hometown of Inglewood. He also received the NBA’s Home Team Community Service Award for his outstanding charitable contributions. 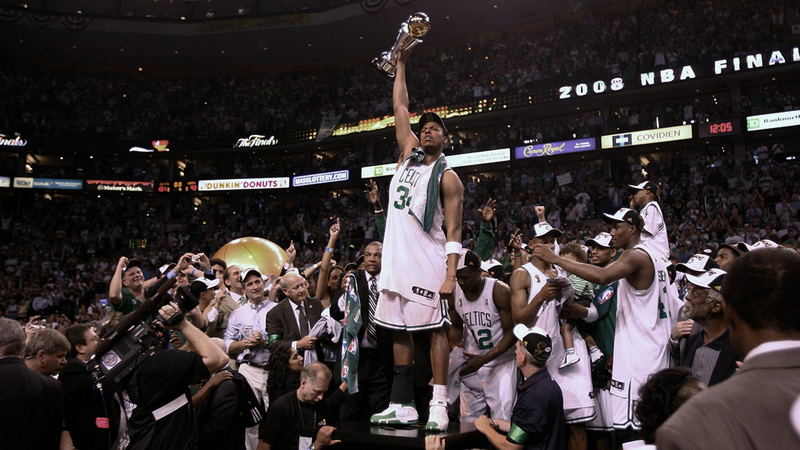 From 2002 to 2006, Paul made the All-Star team every season. He led the league in total points (2,144) in 2002, and was an All-NBA Third team Selection in 2002 and 2003. He was also selected as a member of the US national team in 2002, and played in the FIBA World Championships. But while Paul was achieving astounding personal success, the Celtics as a franchise was stumbling. In the 2006-’07 season, Boston finished with 24 wins — second-worst record in the NBA — and Pierce played only 47 games due to injury. Unsure of his place in the Celtics’ long-term plans, he set out for the offseason wondering what his fate might be. Then, on draft night in April 2007, the world shifted. Boston general manager worked two trades that brought veteran superstars Ray Allen and Kevin Garnett to the Celtics, surrounding Paul with the talent he had never been fortunate enough to have. Quickly dubbed, “The Big Three”, Paul, KG and Ray orchestrated a heretofore unseen turnaround, leading Boston to 66 wins and an eventual NBA championship — the first for all three players, the 17th in franchise history. Led by Paul, the Celtics would return to the NBA Finals in 2010, but they fell short in an epic, historic Boston-LA battle, falling to the Lakers in seven games. When Ray Allen left Boston for the Miami Heat in 2012, the Big Three era for the Celtics was over. The following season, the franchise disbanded the squad for good, sending Paul and Kevin Garnett to the Brooklyn Nets. It was a shock to the NBA world, and a dramatic change for No. 34, who had spent his entire career in Boston. For Brooklyn owner Mikhail Prokhorov, however, it was a moment to rejoice. Paul, for his part, agreed. The Truth brought fire and passion that Brooklyn that sorely lacked during a first round playoff exit in 2012-13. Under his leadership, the Nets waged numerous hard-fought battles throughout the course of the year, giving birth to new rivalries with Miami and Toronto. 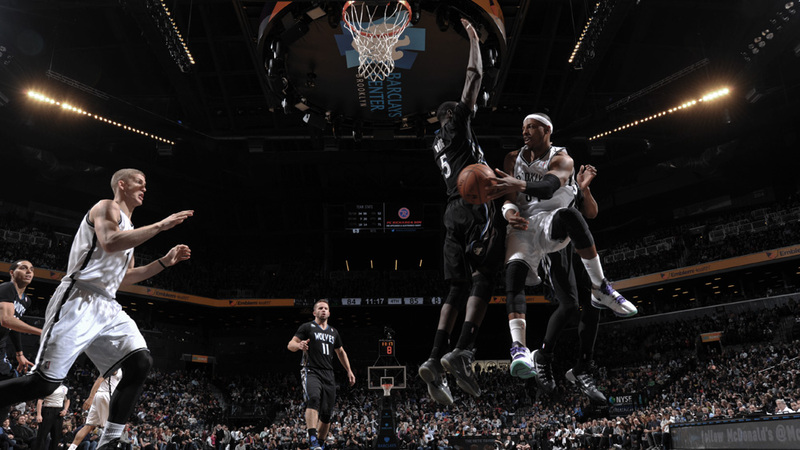 In the first round of the playoffs, Brooklyn batted a pesky young Toronto team through seven hard-fought games. In the final deciding contest, it was the Truth who blocked Kyle Lowry’s shot at the buzzer, preserving the win and sending the Nets to the Eastern Conference semifinals against Miami, the defending champions. Unfortunately for Paul and Brooklyn, the well-rested Heat proved too formidable an adversary, and the Nets season ended after Game 5. Nonetheless, No. 34 looked back on the year favorably. In the summer of 2014, after a season with Brooklyn, Paul found himself on the free agent market for the first time in several years. He chose to join a young, talented Washington Wizards team, hoping to provide the franchise with the veteran leadership necessary to turn it into a real contender. No. 34 announced his decision via a tweet early on a Sunday morning, priming president Barack Obama and Wiz point guard John Wall for his impending arrival. After one season in Washington, Paul decided to rejoin his former coach in Boston, Doc Rivers, bringing his veteran knowledge and leadership to the Los Angeles Clippers. The 10-time All-Star forward formally signed with the team on Friday after spending last season with Washington, with which he averaged 11.9 points, 4.0 rebounds and 2.0 assists while starting 73 games. He reportedly agreed to a $10 million, three-year deal after turning down the Wizards. For the first time in his career, Paul was coming off the bench, but he did what he could to find places to contribute. He also continued to hit career milestones. In a game against the Sacramento Kings on Jan. 16, 2016, No. 34 passed 45,000 minutes played for his career, becoming the 17th player in the history of the Association to pass that mark. At the beginning of the 2016-17 season, Paul announced that it would be his final year as an NBA player. Shortly after Pierce completed his playing career, The Truth joined ESPN as an NBA Studio Analyst, contributing regularly to NBA Countdown and The Jump, providing his take on the most compelling topics around the association by drawing on his own experiences in the league and his knowledge of the game. ESPN NBA coordinating producer Amina Hussein was thrilled when Paul joined ESPN because of the insight he can bring to the desk on a daily basis.